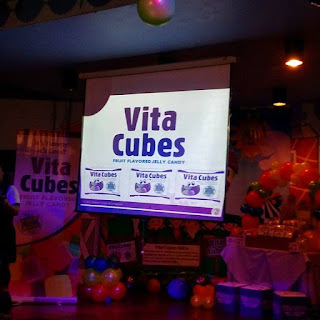 Vita Cubes : Healthy Has Never Been This Yummy! As much as possible, I try to steer clear from sweets when it comes to what to feed Choi. He's already packed with too much energy, I figured, why feed him with something that would amp it up even more! So candies are really a no-no for me. But then again, there are times when I become a little lenient and allow him one from time to time. I didn't want to deprive him of the joys of being a child so sometimes I let him have a bite or two of cake or half a candy. Good thing we were invited by Mommy Bloggers Philippines to this really fun event where I discovered there are candies out there that can also provide essential vitamins and minerals that our kids need! 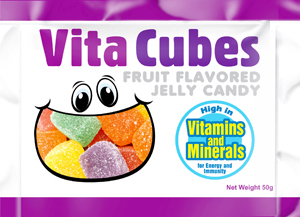 Say hello to VITA CUBES. Vitamin B: supplies 30-70% of the child's RENI. Promotes growth and strength, and stimulates memory in children in their formative years. Help boost the oxygen circulation in the body, especially the brain, which in turn improves concentration. Helps convert carbohydrates and fats into energy. Vitamin E: boosts the immune system and helps the body fight germs. Keeps blood vessels open wide enough for blood to flow freely. Help the cells of the body work together to perform many important functions. Awesome! These yummy, cube-shaped babies come in different flavors such as strawberry, apple, grapes, orange and mango. They taste like real fruits and are soft as gummy bears too! Vita Cubes is available at all Mercury Drug outlets, SM Supermarkets, Robinsons Supermarket, Waltermart, Landmark, Puregold, Mini Stop and local grocery stores. They can be bought per box which contains 10 pcs of 50g packs each, per piece which costs P1.00 at sari-sari stores. The suggested retail price per pack is P12.00 pesos! After the event yesterday, my niece and my son couldn't contain their excitement to try Vita Cubes and just as I expected, they loved it! See mommies? We can now give our child candies but these are wonder candies that contain the vitamins and minerals we want our child to get from the things they eat! What are you waiting for? Get yours now!